A car is something that many of us couldn’t be without. However, it can be easy to start neglecting it. Once you’ve owned a car for more than a few months it can be tempting to start to wash and clean both the outside and the interior less and less, and rubbish can easily build up. However, keeping your car clean and tidy, and staying on top of basic car maintenance can be very important. Have you ever thought about your car becoming a fire hazard? Chances are you might not have, but with all of the electric components and fuel, a car could easily become a fire hazard if it isn’t properly looked after. The Fire Service explains how on average 300 cars per day develop into fires, totalling 100,000 cars a year. They say that 65% are due to thefts and being deliberately burnt to cover evidence, or that some people vandalise their own car by setting it alight for a fraudulent insurance claim. However, BT say that many of the remaining fires are due to a simple lack in maintenance, and can be stopped. So how do you prevent a fire from breaking out in your car? Keeping the inside of your car clean and tidy not only makes it a more comfortable and healthier environment for you and your passengers to be in, but it will also prevent any flames igniting loose papers and rubbish – aiding the fire, according to BT. When cleaning your interior, the Fire Service suggests checking for signs of any loose wires or for any wear and tear or damage to them. 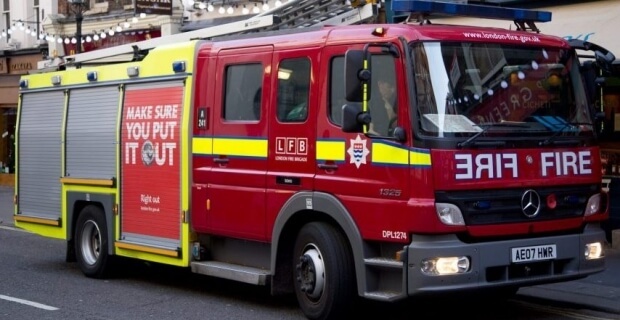 If you come across this in your car, or are having trouble with bad connections, the Fire Service advise you to take your car to a reputable mechanic who will be able to fix the problem. When it comes to car interiors and fabrics, nowadays these are often made up of polymers, plastics and other synthetic materials – all of which are flammable. The fumes that can come off of these materials if they catch fire can be highly toxic, so the Fire Service remind drivers to be extra vigilant if they use matches or smoke cigarettes within their car. Make sure you only use these items when stopped safely to avoid being distracted while driving, and dispose of any lit items properly to minimise risk. It’s also important to be prepared. The Fire Service advise that you keep a multi-purpose dry powder or foam spray extinguisher, that conforms to BS EN3, in your car at all times, so that you’re all set in case you ever encounter a fire in your car. With fuel being highly flammable, the Fire Service advise regularly checking the fuel lines are in good working order and that there is no sign of damage. If you like working on cars and use welding equipment then remember to never use a naked flame, heat or welding equipment near the fuel tank or pipes that lead to the tank, as this could likely cause a fire – or a possible explosion. When working on a car regularly check both inside and outside of the car during the project, to make sure materials are intact and are not close to sparking a possible fire. Once you have parked and left your car, there are a few safety tips for you to remember to help you keep your vehicle as safe and secure as possible, deterring thieves or criminals from being able to tamper with it. Close all windows and sunroof to keep the vehicle secure. Always remove the ignition key, even if you are just jumping out of the car to run into your house or to pay for petrol. Don’t make it easy for criminals. Park in a well lit area, to deter thieves and vandals. Always remove or hide valuables. Fit an anti-theft device to your car, as these can deter thieves. You can often get an insurance discount for an having an approved alarm/immobiliser fitted. insurethebox telematics boxes can provide you with a theft tracking system, so that if your car is stolen we can use the GPS information to help find its location. Find out more about our theft recovery service. Check out this blog from our sister brand drive like a girl for more tips on avoiding car crime. Release the bonnet, but do not open it – as this could allow more air to get in and potentially make the fire worse. Get any passengers to leave the vehicle, and move as far away from it as possible. If you can, and it is safe to do, warn oncoming traffic of the fire. Never use water on an engine fire – it can spread burning petrol and make the situation much worse. BT advise that unintended car fires are not very common in the UK, and following these simple steps can help you minimise the risk of your car catching fire – preventing you from being one of the 35% of accidental car fires that the fire service deal with each year.